The 2nd grade PARCC test has come out of hiding. This image has been making the rounds on social media. 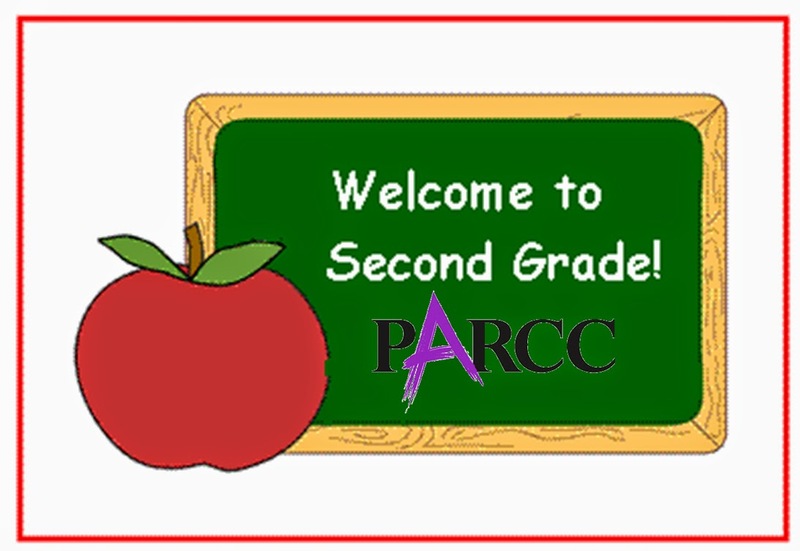 It seems a K-2 school in Lake Hopatcong, NJ has already field tested PARCC for 2nd graders. And a quick google search reveals they are not the only district. Pleasantville Public School's April calendar shows 4 days of grade 2 field testing starting tomorrow. If you jump on over to the PARCC website, here is what they have to say about their K-2 Formative Assessments. To help states measure student knowledge and skills at the lower grades, the Partnership will develop an array of assessment resources for teachers of grades K–2 that are aligned to the Common Core State Standards, and vertically aligned to the PARCC assessment system. The tasks will consist of developmentally-appropriate assessment types, such as observations, checklists, classroom activities, and protocols, which reflect foundational aspects of the Common Core State Standards. The K-2 formative assessment tools aim to help create a foundation for students and put them on the track to college and career readiness in the early years. Experiment, research, or trial conducted under actual use conditions, instead of under controlled conditions in a laboratory. Also called field experiment. I post these definitions to make it clear that a field test is little more than an experiment; an experiment being conducted on public school children by a for-profit company using tax payer resources and your children. Pearson conducting field tests on 7 year olds is not for the benefit of the children, it is for the benefit of Pearson. 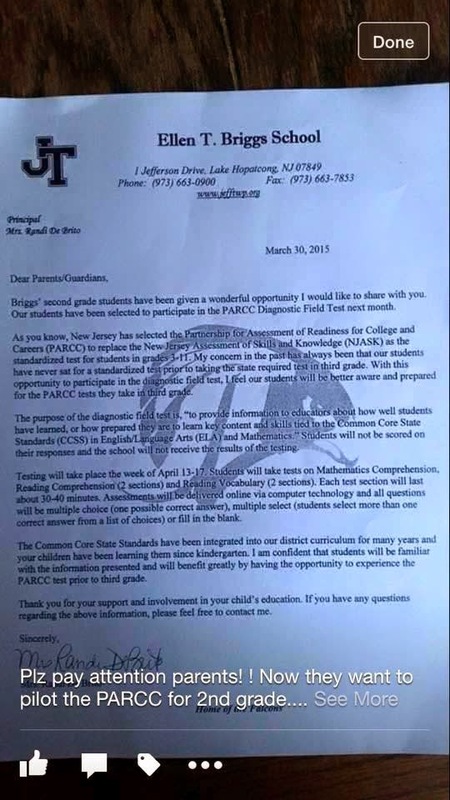 Here is PARCC's report from their 2014 field test. Please, try to find some reference to the field test being beneficial to student participants. Field testing is actually to the detriment of students who are missing instructional time to help Pearson refine their product. Last year sixth graders in Massachusetts were smart enough to realize that they were being used as guinea pigs for Pearson's profits, and they asked for payment for the time they spent field testing Pearson's product. One student, Brett Beaulieu, drafted a letter asking that he and his classmates be paid for their time and even calculated how much they should receive if they were paid the minimum wage for 330 minutes of testing : a total of $1,628 to be divided among the kids. The Lake Hopatcong principal admits in her letter that "students will not be scored on their responses and the school will not receive the results of the testing" while making a feeble attempt to claim students will benefit solely by being forced to sit for a standardized test at the age of 7 to prepare them for the test when they are 8. That's a pretty hard sell. If NJ districts implement Pearson K-2 tests, will 5-7 year olds be forced to agree to the same code of silence that students in grades 3-11 must abide by? If you are still not sure that it is a bad idea to allow a for-profit behemoth like Pearson to write tests for children as young as 5, please read this post now. And since all of these assessments are purchased from private corporations, the testing material is ideological property. The students taking these exams – regardless of age – are no longer treated as children. They are clients entering into a contract. At the start of these tests, students are warned of the legal consequences of violating the terms of this agreement. There is no way that young children can possibly understand the consequences of such agreements, and far too many parents are unaware of what their children are being forced to agree to just to sit and take a test. -talk with others about questions on the test during or after the test. -take notes about the test to share with others. Sure kids shouldn’t talk about the test with classmates DURING the testing session. Obviously! But why can’t they discuss it after the test is over!? Can 5 - 7 year olds even be asked to agree to such terms? We saw what happened to older students that made the mistake of mentioning PARCC on social media. What will happen to a 7 year old who's caught talking to the kid at the next lunch table? Will there be disciplinary consequences if a 2nd grader talks to a 1st grader about the test questions? Will the student get detention? Suspension? To be clear, assessments in grades 1 and 2 are not new. The NJASK had 1st and 2nd grade tests, called the NJPASS, which were not state mandated and were not reported to the state, but districts could choose to administer. My own district administered NJPASS, and two years ago I opted my daughters out of the test. Last year the district decided not to administer the test, and I was told by an administrator that they "never got very good data" from the test anyway. The major difference here, as I see it, is that the state of NJ is potentially allowing Pearson, a multi national, multi billion dollar company, to have a monopoly, not only on testing our children in grades K-11 but also in preparing them for the tests and offering remediation products based on test results. To prepare their students for Pearson exams, districts can buy Pearson textbooks, Pearson workbooks and Pearson test prep, such as a suite of software that includes 60,000 sample exam questions. They can connect kids to Pearson’s online tutoring service or hire Pearson consultants to coach their teachers. Pearson also sells software to evaluate teachers and recommend Pearson professional development classes to those who rate poorly — perhaps because their students aren’t faring well on Pearson tests. The New Jersey Assembly has already passed a bill that would prohibit the administration of non-diagnostic standardized tests prior to 3rd grade. The Senate needs to act now. They have the power to keep Pearson away from our youngest students. If Pearson's grade 3-11 tests were field tested in NJ in the 2013-14 school year and implemented in the 2014-15 school year, it stands to reason that a Grade 2 field test this year means the introduction of a Grade 2 PARCC test next year. So what is the NJ Senate waiting for? I've noticed a new and interesting kind of honesty in recent debates about testing and accountability. As lawmakers and education leaders try to sell the merits of the current testing regime and respond to the testing revolution that is sweeping the nation, a very telling narrative has emerged. Here are three instances that have jumped out at me in 2015. This was an exchange on January 21st between Senator Elizabeth Warren and Wade Henderson of the Leadership Conference, at the first Health, Education, Labor and Pensions Committee hearing on the reauthorization of NCLB. The title of the hearing was Fixing No Child Left Behind: Testing and Accountability. Warren to Henderson: Do you see anything in this proposal that would make sure that the states that take this money actually end up helping the kids who need it the most? Henderson: Interestingly enough, your point about taxpayer accountability was just reinforced in the last several days by the George W. Bush Institute which issued a report under the authorship of Margaret Spellings that talks about the importance of annual accountability for purposes of ensuring that dollars and tax dollars indeed are well spent. Warren: I understand the need for flexibility but if the only principal here is that states can do whatever they want then they should raise their own taxes to pay for it. Throwing billions of dollars at the states with no accountability for the states for how they spend the taxpayer money is not what we were sent here to do. So, what does that Bush Institute report say? This past Tuesday Diane Ravitch was on All In with Chris Hayes. 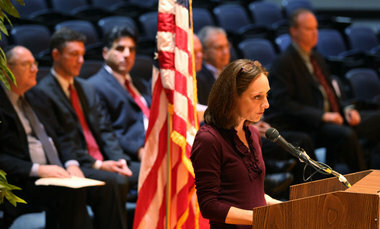 She was the counterpoint to Merryl Tisch, the Chancellor of the New York State Board of Regents. The topic was the testing revolt currently happening across New York state where refusal rates in some districts are approaching 90%. You can watch the video here, the relevant exchange between Ravitch and Tisch starts at the 5:20 mark. tests provide no instructional gain. Ravitch: Now, when we talk about the results of the tests, they come back 4-6 months later, the kids already have a different teacher, and all they get is a score and a ranking. The teachers can't see an item analysis, they can't see what the kids got wrong, they're getting no instructional gain, no possibility of improvement for the kids because there is no value to the test. They have no diagnostic value. If you go to the doctor and you say, "I have a pain" and the doctor says, "I'll get back to you in six months" and then he gets back to you and tells you how you compare to everyone else in the state but he doesn't have any medicine for you. Hayes to Tisch: How do you respond to that? At a Town Hall meeting yesterday another NJ citizen confronted Governor Christie about PARCC. Here's what happened. Later, Marlene Burton, 77, of Ridgewood, called the Common Core educational standards "shoddy" and the new standardized tests known as PARCC "a waste of time." What, she asked, was Christie going to do about that? Christie, who once declared that he and other governors were "leading the way" on Common Core, said he had "concerns" about how the standards had been implemented and was awaiting a report he commissioned to study them. The report, he suggested, would provide guidance as to how to "amend or abandon" Common Core, Christie said. Conservatives have denounced the standards as federal encroachment on the classroom, though they were developed by the National Governors Association and education experts. To me, the "aha moment" Chris Hayes had in the interview with Ravitch and Tisch perfectly exemplifies the awakening parents across the country are experiencing. There is a dawning awareness that these tests are not for the benefit of our kids, their teachers or their schools. The true purpose of these tests is finally being revealed - they are a measure used to hold the public school system accountable for the tax dollars they receive. I find the honesty of these statements refreshing. Let's be direct and open about this. The tests are not for the benefit of students or teachers, they're for the benefit of taxpayers. Lawmakers and education leaders like Tisch need to be direct and honest about this. Let them try to explain to parents that the test has no value for children, but they will lose arts programing, recess, librarians, guidance counselors and nurses so that tax payers can be sure their tax dollars are being well spent. Let them explain to parents that their kids won't get any anything out of it, but at 8 years old they will to be subjected to 8 hours of high stakes standardized testing and countless hours of test prep so adults can justify spending tax dollars to foot the bill for public education for all kids. Those are pretty hard messages to deliver - no wonder they've been trying to convince parents the tests are good for kids. Problem is, every year less and less parents buy it.